Reservations can be made up to 7 days in advance. All reservations require a credit card guarantee. You can book tee times online at www.GOLFZING.com or call the Golf Shop at (858) 279-1600. 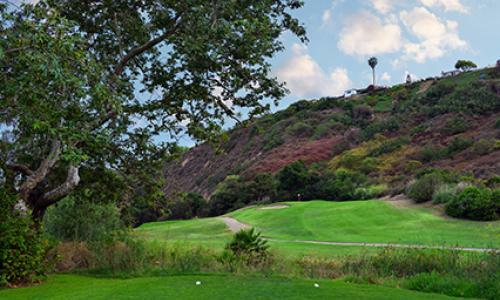 Designed in 1964 by PGA legend Sam Snead and renowned golf course architect Robert Trent Jones Sr., Tecolote Canyon Golf Course is situated in the beautiful coastal neighborhood of Claremont, just a short drive from downtown San Diego. This 18-hole executive course features all the challenges and delights of a full-length course: elevation changes, challenging tee shots, undulating greens, and hazards on almost every hole. This 3,161-yard par 58 course, located just minutes from Pacific Beach, ensures each player an excellent tee-to-green experience. Tecolote Canyon Golf Course has been rated “Best Challenge at an Executive Golf Course,” by Southland Golf magazine and included on their “Hot List” of best executive courses in California. The course offers a well-lit grass tee driving range, with practice bunkers and greens.